And so the fun begins. A charming, faithful, realisation of a successful book by Claire Freedman. This Saturday morning production was well attended by a faithful audience of children predominantly in the 3-7 category. They were not disappointed. They loved it. Featuring Monty, his mum, and invented monsters, the performance culminates with the appearance of the large, but not too scary, Monstersaurus himself. A simple set, bright monsters, and easy to follow story, works well for youngsters. Audience members are invited to contribute ingredients such as sausages, cheese, belly button fluff, and smelly socks into Monty’s monster making machine, and there are song and dance routines to entertain, engage, and delight. When a toaster walks, the children roared with delight, with a similar reaction to a rogue robot . . . and sausages. Sam Hoye is suitably boyish as Monty. Natalie Simone is the star as Mum, cajoling and looking after the audience as well as Monty. Monstersaurus himself is played as a diamond geezer by Mark Collier. 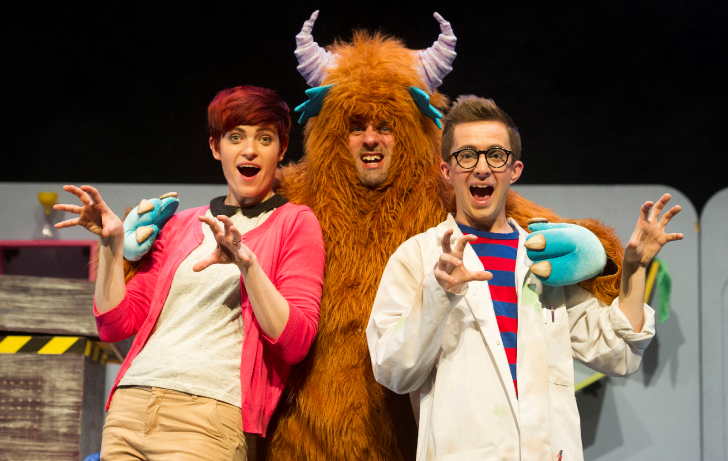 The Big Wooden Horse Theatre Company were responsible for the successful tour of Aliens Love Underpants, so have a track record of knowing what keeps young children entertained. At fifty minutes, with no interval, every child’s attention was held, and the performance did not outstay its welcome. The book is short, but director, and adaptor, Adam Bampton Smith does a good job at stretching out the narrative for live performance without losing the spirit of the original work. Pantomime is the traditional children's introduction to theatre and this show serves the same purpose, even having audience participation sections along with silly songs, and dances, to have even mums and dads, grans and grandads singing along. An ideal first show for a child. Four-year-old Jacob described the experience as “epic”.